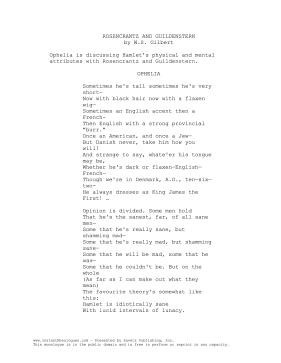 Ophelia describes Hamlet in this 1-2 minute monologue for women from W.S. Gilbert's play, Rosencrantz and Guildenstern. Ophelia is discussing Hamlet's physical and mental attributes with Rosencrantz and Guildenstern. Then English with a strong provincial "burr." But Danish never, take him how you will! With lucid intervals of lunacy.